GOLD COAST (Australia) – Singapore gave up a third Commonwealth Games table tennis crown on Saturday (April 14), when Yu Mengyu fell in straight games in the women’s singles final. 50 lost 7-11, 6-11, 2-11, 7-11 to India’s Manika Batra to settle for the silver. This is the first time that Singapore have not won the women’s singles crown since 2002. The bronze medal went to two-time defending champion (2010 and 2014) Feng Tianwei, who beat Canada’s Zhang Mo 11-2, 11-7, 5-11, 8-11, 11-7, 11-3 in the play-off for third place. The Singaporean top seed and world No. 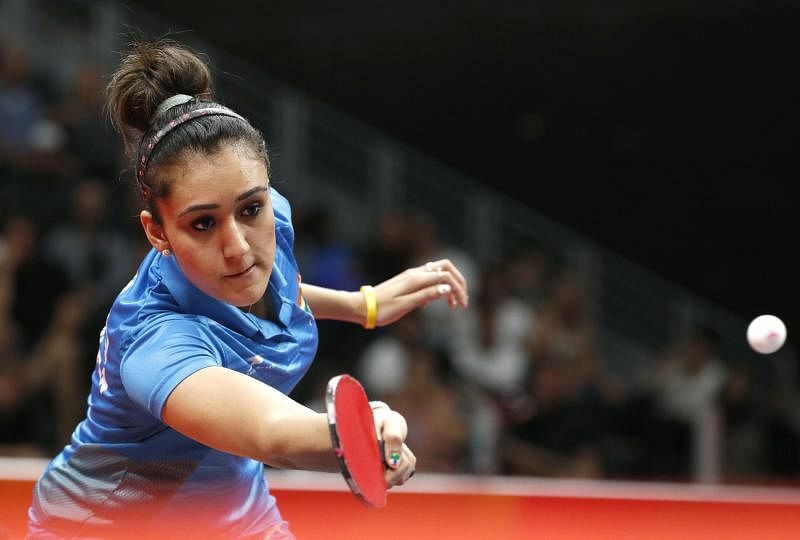 4 had earlier been beaten by Batra, a player ranked 54 places below her, in the semi-finals. Feng fell 10-12, 11-5, 8-11, 11-5, 11-5, 9-11, 11-13. The Indian had also beaten the Singaporean in the final of the team event last Sunday as Feng and Co lost the team title. Their male counterparts, fielding a new-look side with three teenagers in the line-up, also relinquished the men’s team title to India, falling to their Asian rivals in the semi-finals and ending fourth after losing to England in the bronze-medal play-off. A visibly upset Feng, the two-time defending champion (2010, 2014), told The Straits Times after her semi-final loss: “I felt I had prepared well and played well in the match today. “However, when I was leading 8-4 in the rubber, I was quite nervous and played more conservatively. Batra said: “ I started fighting for each and every point (in the last two games). She was confident playing with me. I was shouting so she was getting under pressure. “I was not thinking that she’s the world No. Yu will also feature in mixed doubles final on Sunday with Gao Ning after the pair beat India’s Sharath Achanta and Mouma Das 11-8, 9-11, 9-11, 11-7, 11-7. The Singaporean pair, top seeds in the competition, looked comfortable in the first game, but had to fight back against the third seeds after conceding the next two games in the best-of-five tie. “Going into this match, we had the slight advantage, but when we lost the point at 9-7 in the second game we should have changed our shots, but we persisted and didn’t,” Gao, 35, told The Straits Times after the match. In reaching the final, Singapore have secured a medal in an event in which they failed to win a medal in Glasgow in 2014. Then, Feng and Zhan Jian lost both the semi-finals and the bronze-medal match. Gao and Yu will face Liam Pitchford and Ho Tin-Tin of England in the final.